The APEX Program is a homeschool enrichment program, and we exist to supplement and complement the efforts of parents who have chosen to be their child’s primary educator. At APEX, we believe the best people to make the best decision about the best education for a child are the parents. Our mission is to come along side of homeschooling parents and provide for homeschooled students the best of both worlds, bringing together the dynamic experience of a public school classroom and the freedom of a homeschool education. How did the APEX Home School Enrichment Program start? The APEX Program, sponsored by the St. Vrain Valley Schools, is open to students in grades K through 12, and is designed to support parents who choose to educate their children at home. Parents remain the primary instructional provider, with the school supplementing and complementing their efforts. The APEX program has its roots in the Options Program, founded and created by Dr. Tom Synnott under the Aurora Public School District. Dr. Synnott’s vision was to support families who choose to educate their children at home by providing enriching classes and curriculum resources. Under his leadership, the Options Program grew from 30 students in 2002 to over 1900 students and has served home school families from Castle Rock to Estes Park. Beginning in the fall of 2012, this highly successful program took on a new name within the St. Vrain district boundaries and transitioned to the sponsorship of St. Vrain Valley Schools. Since 2012, APEX has grown from 250 students to over 800. In 2015, APEX added an expansion site in Frederick which opened with over 150 students the first year. In 2016, APEX broadened it program offerings to include two track – Blue Track and Silver Track – each with a different focus. Beginning in the 2017-18 school year, APEX will offer sites every day of the week, all of which include classes in the arts, technology and all subject areas from PE to Physics. Families participating in APEX receive instruction and most educational materials at no cost, made possible by your tax dollars provided through the district. What are the attendance expectations for students? Students who enroll in APEX attend six hours of classes one day per week and are considered part-time public school students. Parents choosing APEX still consider home schooling their primary means of educating their children. Each registered student must spend a minimum of 90 hours per semester with the APEX instructors in their choice of APEX classes and are expected to attend classes regularly each week. Please see our Family Handbook for complete attendance policies. Families may register with APEX regardless of which Colorado school district they reside in, but in-district students are given priority in enrollment. Out of state students will not be considered for enrollment until they relocate to the local area and provide proof of address. 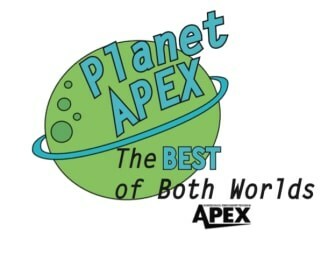 Why would parents choose APEX?